Staying on top of home maintenance and improvement can be difficult and expensive, especially in an age when were all too busy even to eat breakfast in the morning. You may feel like you dont have time to vacuum and dust, much less fix a finicky interior door. This, however, does not have to be. With a little ingenuity and a spare afternoon, you can fix some of your homes annoying little problems on your own—no expensive contractor needed. If you have doors in your house that just wont stay shut, follow these easy guidelines to diagnose and cure the problem for good. When a door wont stay shut, there are generally two things that may be causing the problem. The most common issue is a worn out latch mechanism. If your door knob is old and loose, or the latch itself has been worn down over the years, you will probably need to replace this mechanism in order to repair your door. In some rare cases, the strike plate itself has been worn away so much that it simply wont keep the latch trapped properly. Luckily, these are easy fix's. Pick up a new door knob set from your local hardware or home improvement store, and make sure you have a few screwdrivers on hand to remove the old set. In almost all cases you will need a long Phillips screwdriver with a very narrow shaft, as the knob itself hinders access somewhat. With a lever-type knob this should not be much of an issue. When you remove the mounting screws from the door knob and latch, the whole mechanism should slide out easily. Replacement should be as easy as sliding the new latch and door knob in, and tightening the screws. If youre dealing with an older door, you may need to drill new holes to accommodate the modern fittings. Once the new door knob and latch are installed, your door should open smoothly and close securely every time. From time to time, the problem will be slightly more complicated. If a new latch and door knob wont fix the problem, then youre most likely looking at a problem with the dimensions of the door frame. This problem will most likely be encountered in older homes when doors were not as standardized as they now or when it is not a pre-hung door and the carpenter that installed it was sloppy. If the frame is just slightly too large for the door, the latch will never hold securely. This problem is slightly more difficult to fix, but can still be done on your own. You will need to loosen the doors hinges at the places where they attach to the door frame or on the frame. Dont remove the door completely, as it will be a major hassle to refit it unless you have installation experience. Hinges are mortised into both the door and the frame. Usually, eliminating the mortise gap on one side or the other will be sufficient. Popsicle stick shims are a great fit. Simply loosen the hinges until there is enough play for you to insert wooden shims underneath the hinges and slide them back against the screws. Remove one screw at a time and replace it with a longer one. This will help close the gap between the doors latch and the frame, allowing it to open and close properly. Since the gap might look a little goofy, simply run a bead of caulk between the hinge and the wood. 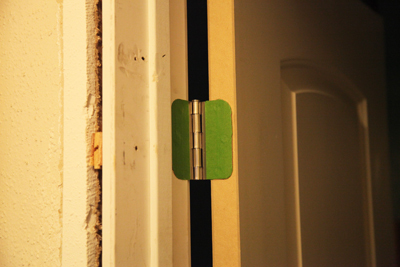 Fix your finicky door today and never worry about it again. These techniques should work for most interior doors, whether youre dealing with a standard single swinging hinged door or UPVC French doors in your home. The problem could be natural wear and tear, or improper installation from the start, but these two easy fixes should remedy the problem either way. Break out your tools, take a trip to the hardware store, and enjoy properly working doors for years to come. Sometimes a door that worked properly before won close smoothly anymore; it drags or catches. This is usually due to foundation problems and your home is settling. This can be a major problem. Yes, you can address the door issue by itself but know that is just a band-aid. What you really need is foundation repair. This is an expensive proposition but the future problems will incur even higher costs. These problems include window and cabinet door problems, cracked drywall, and energy loss. You can find a reliable local foundation repair company with a service like Angies List—find thousands of unbiased ratings and reviews on service companies in your area; join Angie’s List today.